The Apex 6 mm Titanium Lined Nylon ll Neoprene Boot is a Premium Boot that features a Sturdy Rugged High-Traction Sole that is Strong enough to Resist Punctures from Rocks, Shells, and even Glass. The Sole has a Low-Profile to Enhance Comfort and fit into any Fin Foot Pocket on the market. The Heel and Toe Caps are Extremely Strong and will protect the Boot from Wear and Tear by the Fin Foot Pocket. A Heel Lug will not allow Fin Strap Slippage when Fining. 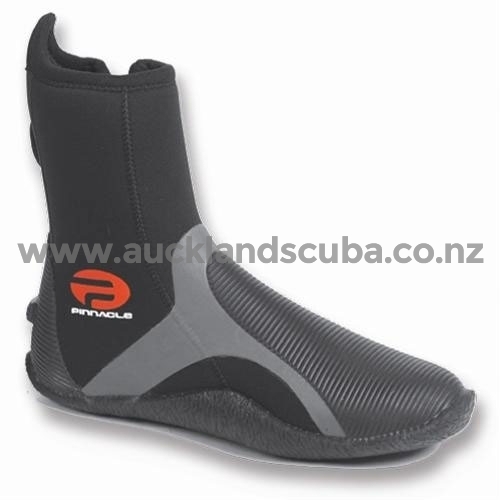 Designed for Cold Water Diving, with its Gusseted #10-YKK Locking Zipper and Velcro Zipper Flap to keep Cold Water Out-and-Away from Ankle and Seals the Top of the Boot keeping the Zipper Up. All the Boots Seams are Glued and Flat-Lock Stitched for Strength and Durability. Boot has a Foxing Strap over Instep that provides Tremendous Lateral Support, even when Wet! Boots come with a Multipurpose Mesh Carry Bag is Black and Gray in color and is covered by a 12 month limited warranty. Foxing Strap Adds Lateral Stability even when Wet!